I'm excited to share with you, my SRC assignment for this month. I had the wonderful Kate, who authors Food Babbles, a ridiculously delicious blog. Kate has so many wonderful recipes on her blog and that made it really hard to pick one for this months reveal. I was torn between so many treats, but not having access to an oven at the moment, helped me narrow my options down. 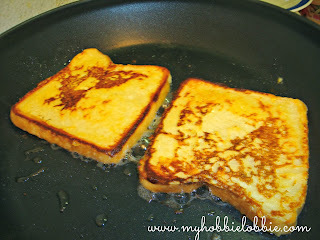 I went with something I knew I'd love, a delicious breakfast treat, Buttermilk French Toast. I have made French toast before but never with buttermilk and I was curious. Now only recently I got to experience first hand the kind of magic buttermilk does with pancakes and I was very eager to see what it would do to French Toast. And I was right, these slices turned out really good. 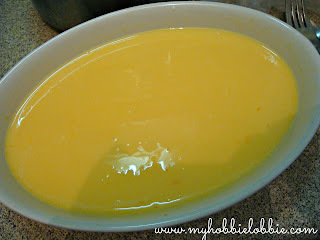 There is a depth of flavor with a mild tang that you can get only by using buttermilk. This was Sunday breakfast for us and we thoroughly enjoyed it. I stuck to the recipe for most of it, except I used regular sliced bread instead of the challah bread and I left out the ground cinnamon, not because I have anything against it, but because I forgot to pick it up at the store :( Despite that, the French Toast was fantastic and I'm sure I'll be making this yummy breakfast treat often. 'Thanks Kate, for a delicious take on one of my favorite breakfast treats. I know I'll be back to try out more of the treats on your blog'. Beat the buttermilk, eggs, salt, sugar and essence well to combine. Dip the slices of bread in the batter one at a time, letting it soak in some of the batter and flip the slice over to repeat on the other side. Take care to not leave the slice in the batter for too long, else it will get too soggy and break apart when you try to get it to the pan. Butter the griddle lightly for frying. Carefully, place the slice onto the pan and cook until lightly browned (or to your liking) on both sides. Drizzle some honey over it and enjoy. That french toast looks yummy! 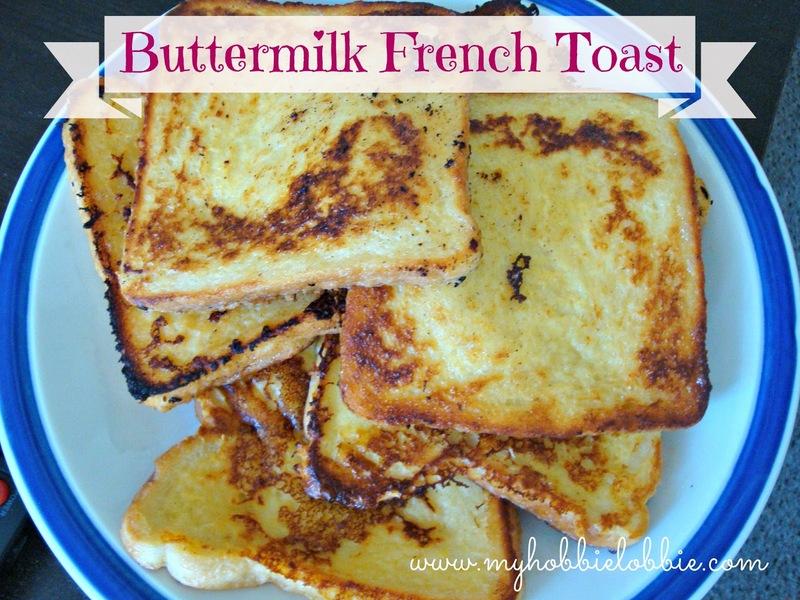 I've never thought of using buttermilk for french toast. Sounds amazing and I usually have some on hand for my biscuits. Me neither Angela, but the results were lovely! This looks delicious- I LOVE french toast but have never made it with buttermilk! 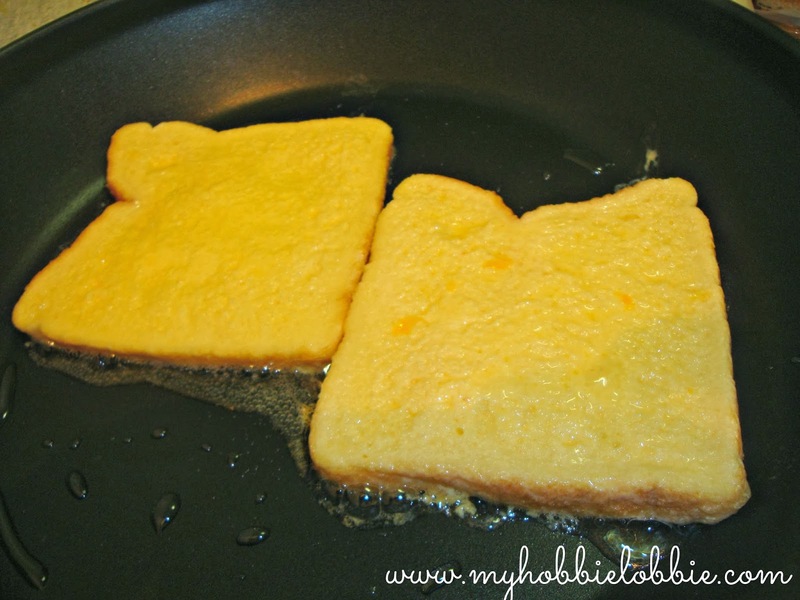 I never would have thought to use buttermilk for French toast, but what a genius idea! I usually have some leftover from making soda bread, so I'll have to give this a try. Thanks Lesa, all credit to Kate for the inspiration. I would have never thought to use it either! Yum. I love French toast but wouldn't have thought to make it with buttermilk which I pretty much always have on hand. Great choice Trisha - We love buttermilk pancakes but I hadn't considered using buttermilk for French Toast. I will be trying this soon!! What a great pick! French toast is one of my favourite lazy weekend breakfasts, and I can just imagine how nice it would be with that subtle tang of buttermilk to contrast against the sweet syrup. Adding this to my list of things to make during the holiday break! What a great idea - I'm so curious now too! I'll have to try my next french toast with buttermilk - it's a great way to use the leftover that always seems to be around from certain recipes. Great pick! Just the kind of recipe I was looking for the weekend breakfast. French Toast like this looks perfect. Excellent pics as well. So happy you enjoyed this french toast! I'd forgotten all about that recipe. An oldie, but goodie. Thanks for refreshing my memory! Thanks for a wonderful brekkie inspiration Kate!